So thankful to welcome my dear friend Teresa to the blog again this month! I feel so spoiled to have her so often lately! Y’all, this gal is SO INSPIRING. Please follow her on Instagram HERE. And if you are looking for super simple, healthy recipes, check out her incredible FREE resource HERE. The holidays can be a little stressful. Many of us are juggling recitals, parties, decorating, shopping, and all while trying our best to stick with our advent calendars and teach our babies the truth about Christmas. Not to mention pulling out our phones in our attempts to capture all the Pinterest perfect images. The holidays can be overwhelming friends, and the excitement of it all can overshadow the truth of the season. The truth is that the same God who holds the magnificent stars in place, who made the earth, the sun and every creature imaginable, humbly came to this world to pardon our sins and give us new life. This Christmas season, lets keep things simple friends. Lets strip the holiday of all the pressure and lets spend more time focusing on that truth. Let’s focus our attention on Him, on His birth and on His salvation! Here’s a simple and stress free recipe that is perfect for a large gathering or a cozy night in with friends. Unfold the pastry sheet on a baking sheet and roll to fit the cookie sheet. Prick the pastry sheet with a fork. Bake for 15 minutes and bring it out of the oven. Top the entire flatbread with a little olive oil and serve warm. 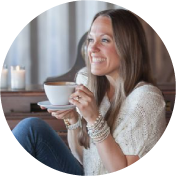 MAKE SURE TO CHECK OUT TERESA AND ALL OF HER INCREDIBLE RECIPES, INSPIRATION, AND ENCOURAGEMENT! Prev Post Simple Countdown to Christmas – FREE Printable!